There’s just no comparison between homemade and store-bought orange juice, But do you know what makes it taste even better? When you’ve got the best oranges for juicing. All oranges are not created equal and some are best for eating, others for cooking but the best for juicing are, well, juicy, sweet, and don’t have too many seeds. Speaking of seeds, what do we want to do with them? Orange Peel and Seeds, On or Off? The peel you want to leave on if you’re crushing your oranges to juice them, because the peel won’t go into the juice, if you’re using a juicing machine however you’re going to want to peel it before you juice it. Orange peel can leave your juice tasting bitter and if you peel it, it means you don’t have to wash it which saves some time. 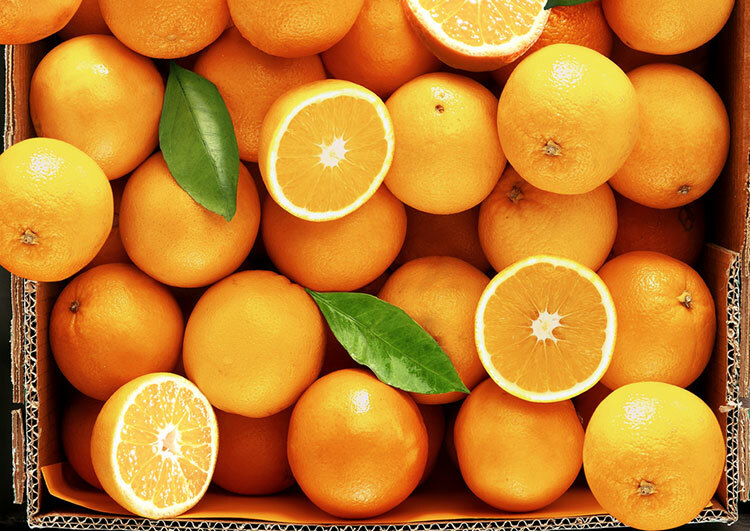 Seeds, however, are a little different, because in an orange the seeds contain limonene which when exposed to air makes your orange juice taste bitter. So if you’re going to be putting your orange in a juicing machine you’ll want to try and take as many seeds out as you can. In a citrus press, you’ll be just fine because the seeds just get caught in the pulp catcher and don’t get crushed or put into your drink. 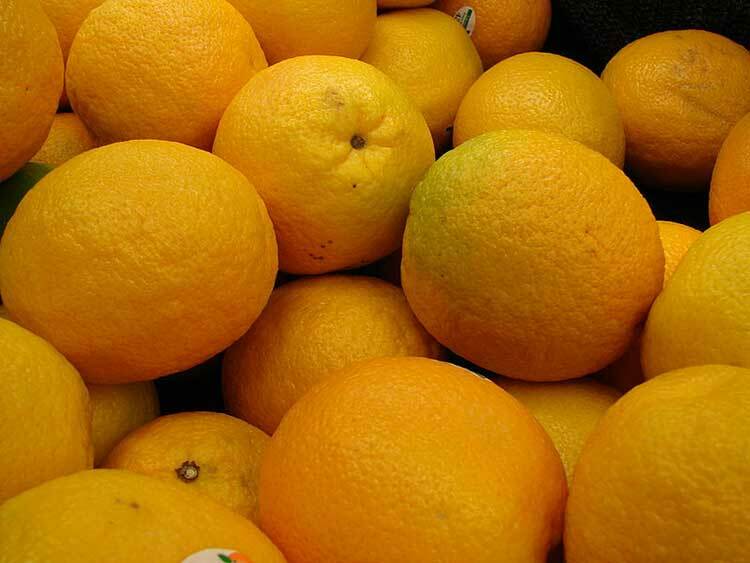 Another quick note on limonene is it’s actually present in the flesh of navel oranges but we’ll get to that later. 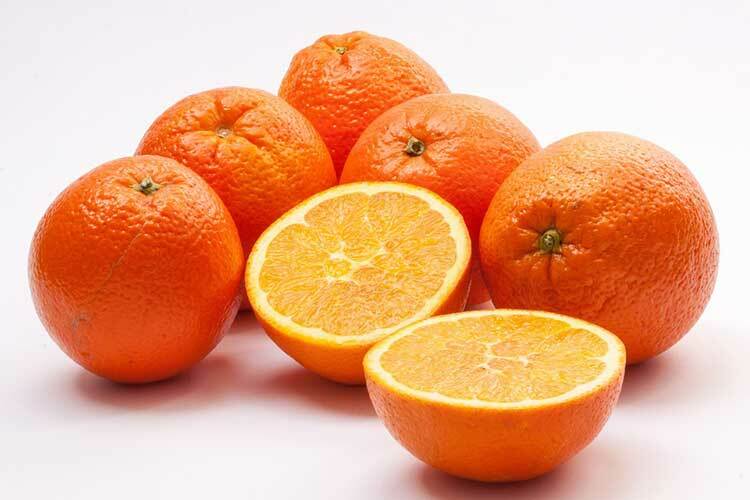 Valencia’s are robust almost year-round oranges that have a sweet taste are full of juice and only have a few seeds inside, typically 9 at an absolute maximum. They’re what most commercial orange juices are made from and they’re in season from April all the way through to December. So you’ve only got that January to March period where you can’t get fresh in season valencia orange. And you’ve also got midnight valencia’s which are actually a seedless variety though they’re less common. Sometimes during the hot summer months they regreen which is where the peel goes slightly green to protect them from sunburn, don’t be fooled they are still ripe and still tasty, they don’t lose any juice or any goodness just change color on the outside. Navel oranges are often the go-to at home juicing orange but as I said before they have limonene in the flesh rather than the seeds. This means that as soon as you juice them they start getting bitter, it takes a few hours before you notice but it means they’re only good to juice and drink immediately, you can’t make batches of juice and keep it in your fridge or freeze it. But their main advantage is there are no seeds, so you can juice away without having to pick anything out and they’re great inside a juicing machine. Still a great orange for juicing but make sure you drink it quickly! They’re in season December through April so cover the offseason of the Valencia orange. 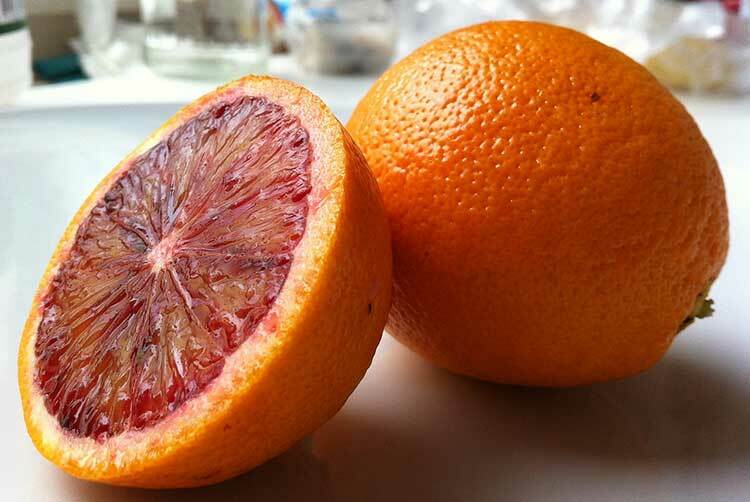 I kid, blood oranges can be really fun to juice because of their distinct color and they’re highest in antioxidants making them the healthiest! Ripe from mid-January through to April the taste is a fresh spicy orange flavour with a really great aroma that’s unique amongst oranges. Not the cheapest but probably the most fun to make juice with, or a nice addition to mix in with other types of orange or citrus fruit. Not your everyday juicing orange but a really nice one to try. Or I should say homemade orange juice because the difference between the stuff you make at home and what’s bought in store can be chalk and cheese. If you buy the expensive organic store stuff it might be ok but even then it’s been preserved and bottled so you’re better off making your own. Bottled orange juice is preserved either by adding chemicals or pasteurizing it which kills off any of the healthy enzymes that might be inside. Plus it can have added sugar and maybe even additional flavorings which you certainly don’t want to have inside you. 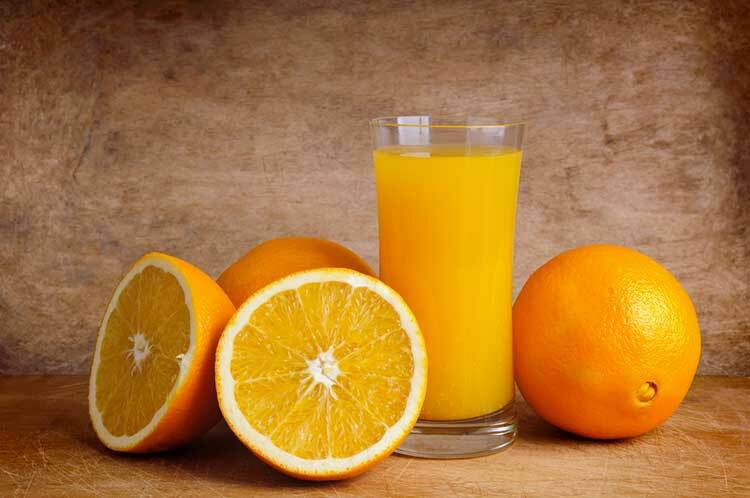 Orange juice you’ve made at home, however, is nothing but just that, the juice of an orange, this leaves you with all the enzymes and the antioxidants like vitamin C which as I’m sure you’re aware is great for your immune system. I’ve got a separate article all about juicing oranges, that is worth checking out but I wanted to share a few of the top tips here as well. Add Pulp After – It depends what type of juicer you’re using but to me, it’s best to juice it so it’s smooth and catch all the pulp, then if you like the bits you can add it in after you’ve finished. Remember it’s easier to put in that it is to take out again so add sparingly and stir before putting more in. Peel It With A Knife – If you’re going to be putting your orange in a juicer then peel it with a knife instead of your hands, this makes sure all the white pith is removed from the outside which doesn’t have any juice in it and just makes a mess inside the machine. To do so, cut the orange in half and put it flesh side down on the chopping board then make small cutting motions from near the top down to the counter following the curve of the orange, repeat around the whole thing then chop the top off. Drink As Soon As – Generally it’s good for about a day especially if you’ve used Valencia oranges, but if you’ve used an orange juicer like one of these I recommend then your juice will last 2-3 days in a container in the fridge. Or you can freeze it of course in which case you can keep it for 3-6 months. But the sooner you can drink it the better it’s going to be. In my head it’s still the Valencia orange that wins as the best orange for juicing, it’s the juiciest and the most readily available but don’t be afraid to experiment, get whatever oranges are available where you are and give them a go, you might find your own favorite.